Beijing started capping new car ownership at 20,000 a month through a lottery system in January last year. But the number of applicants reached 1.07 million this month in the capital city. Discontent is intensifying across China with speculation that more cities will follow Beijing and Guangzhou and limit the number of new cars on the streets as they try to tackle traffic gridlock. While struggling to defend its territory from German and Japanese auto giants in its homemarket, US carmaker Ford Motor Corp's luxury brand Lincoln is looking for a bright spot inChina. The carmaker announced last week in Beijing that it will export its Lincoln vehicles to China inthe last half of 2014. Dealer recruitment will begin in the fourth quarter this year, it said. 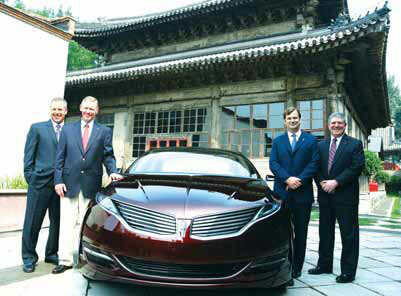 "With the reinvention of Lincoln going on in North America, we now feel the time is right," said Joe Hinrichs, president of Ford Asia Pacific and Africa at a media event in Beijing on August28, when the carmaker also showcased the Lincoln MKZ concept car. Debuted at the Detroit Auto Show in January, the mid-sized four-door sedan with a bold wing-shaped grille and push-button transmission is expected to be the start of Lincoln's resurgenceafter years of sluggish sales. Its mass-produced version will go on sale in the US soon, part of Lincoln's plan to introduceseven new and significantly retooled models before the end of 2014. "During the last couple of years while our new products were being developed, we have been incorporating Chinese preferences and testing the vehicles with customers in China," Hinrichs said. The company declined to specify what models it plans to bring to China, but noted that it will offer a powertrain that meets local demand such as the 2-liter EcoBoost engine. Though Ford will focus on exports of Lincoln to China at the beginning, the company hasn't ruled out the possibility to local manufacturing. Hinrichs said that if demand is strong enough, the company will consider local manufacturing. Lincoln's current annual global sales total about 100,000 units, the majority of them in the US,with small number exported to the Middle East, South Korea and Mexico, according to JimFarley, Ford's vice-president for global marketing, sales and service. "China will be our first major market for Lincoln outside the US," he said. Last year China surpassed Germany to become the second-largest market for premium cars with delivery of about 980,000 units. The number is likely to increase to 1.2 million this year, a 22 percent increase over 2011, well ahead of the growth in the mainstream market, according to LMC Automotive. China is now the biggest overseas market for luxury carmakers Audi, BMW, Rolls Royce,Lamborghini, Bentley and among the top three markets for Jaguar Land Rover, Porsche,Mercedes-Benz and Ferrari. And the long-term picture looks promising. Statistics provided by Ford show that China's luxury vehicle market will grow to about 2.7 million units by 2020, accounting for nearly 9 percent ofthe overall car market, up from about 6 percent today. The significant size and stable growth in the next few years is the main reason that Forddecided to bring Lincoln to China, analysts said. "Of course Lincoln should come to China," said Zhang Yu, director of industry consultancy Automotive Foresight (Shanghai) Co Ltd.
"The country may surpass the US to become the world's biggest luxury car market in five yearsand every luxury brand should certainly come here," Zhang said. Bill Russo, senior advisor of Booz & Co, agreed, noting that "global brands of global companies like Ford need to be introduced to the largest automotive market in the world". China is now the largest auto market globally in unit sales. He said that having a premium brand on the market will also "help upgrade the image of Ford Motor Co in the eyes of the status-conscious Chinese consumers". Yet competition is getting increasingly fierce as the dominant top three German brands Audi, BMW and Mercedes-Benz have about 80 percent of the country's premium car segment andcontinue to aggressively expanding their local production capacities. British luxury carmaker Jaguar Land Rover and Nissan's Infiniti have both announced plans to produce cars in China and will probably have their local plants ready by 2014, when Lincoln just joins the lineup in the crowded market. Another US luxury brand, Cadillac from General Motors Co, previously only made the SLS in China, is moving to produce more new models locally at the end of the year as part of its plan to boost sales in the nation. But analysts still believe the growing market itself will help offset the challenges posed by increasing competition. Even with the planned expansion by global luxury carmakers, there is still an opportunity to carve out a niche due to continued growth in the number of affluent Chinese consumers, though it won't be easy, said Russo. "Having the localized capabilities to adapt Lincoln branded vehicles to the local market will be a critical success factor," he said. Zhang from Automotive Foresight is optimistic. "Lincoln has started to redesign its product lineup and its new vehicles seem to be in line with the aesthetics of Chinese customers." "The brand also has long history and Chinese consumer love brands with heritage," Zhang said.